The integration of slow/fast shredders in various processes, thanks to a partnership with Promeco, makes it possible to condition material at the beginning of the process or prepare it as a final product. In fact, primary shredders can be used at the beginning of the process to regulate the size of material. 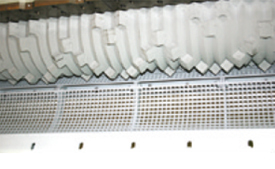 These shredders can also be used as bag "openers" when integrated with an automated sorting plant. Finished products often require a specific particle size. 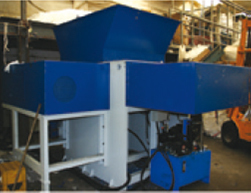 Secondary shredders make it possible to condition the material before being marketed, either for granulation (for materials with a beneficial calorific value), or for compost (making the material size uniform). The different standard output diameters are 12-15 mm, 20 mm, 25 mm and 60 mm. The transmission is carried out by a low-maintenance hydraulic unit offering high torques and superior handling capacity. The unit is controlled by a PLC, and the rotor speed automatically adjusts to the volume being treated (variable torque based on speed).